It was a busy night Monday for emergency crews all over North Texas. Up and down U.S. Highway 75/Central Expressway in Dallas, crash after crash lined the highway. One driver who talked to NBC 5 said she crashed when she was cut off by another car. Willom’s car slammed into the median and then slid over to the shoulder wall after hitting black ice. “So, you go over these patches [of black ice] and you just think that it’s the dirt in the road and or whatever the sand trucks put over, but it’s still ice. So the [roads] are still pretty bad,” said Willom. 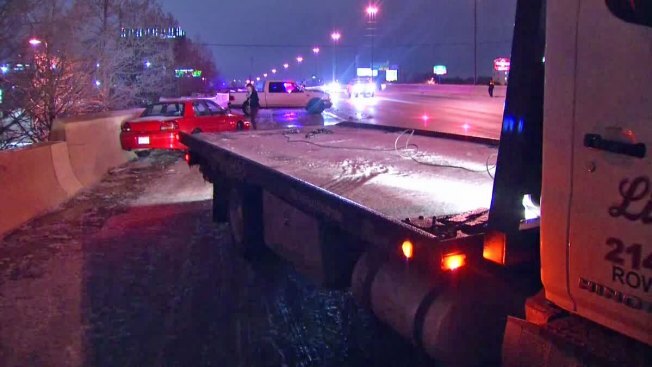 The Texas Department of Transportation is warning drivers to stay off the roads if possible while highways and roadways refreeze during the overnight hours when driving will be even more dangerous.